In addition to naming Father Ramón Gaitán, O.A.R., director of vocations for the province, Father Provincial has named six local vocation directors for the different regions of the province. 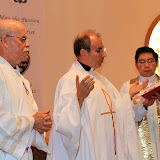 Fathers Eliseo González and Francisco Sandoval, O.A.R., are named for the New York - New Jersey region; and Fathers Michael Rafferty, Domingos Machado, and Juan José Guzmán, O.A.R., for California; while Father Juan José Alfaro, O.A.R., has been named vocation director for Mexico. Though these men are named vocation directors, it must be kept in mind that vocation recruitment is the work of the entire province.